Today’s real party feature is ridiculously fun!! 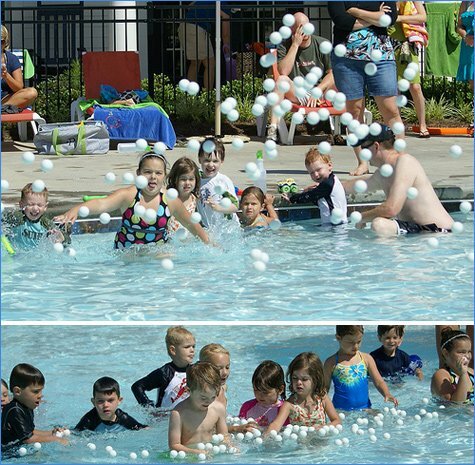 It’s a birthday pool party created by Maureen Anders (and biz partner Adria Ruff) for her son Jeff’s birthday. 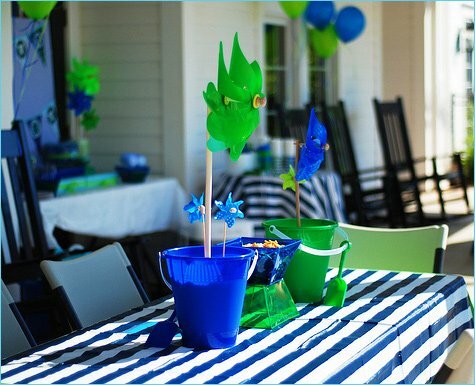 This refreshing take on the backyard pool party has great contemporary style and includes tons of creative details like cupcake “ice cream cones”, bagged lunches served in sand pails, and – my personal favorite – “don’t drink the pool water” water bottles! 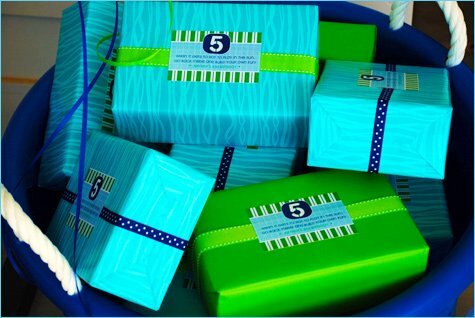 “We decided to throw a pool party for my son’s 5th birthday, and instead of going with a traditional theme like ‘under the sea’ or ‘beach,’ we stuck to a strict color scheme of ‘water tones’ of blue and green, along with fun patterns like houndstooth, stripe and check. 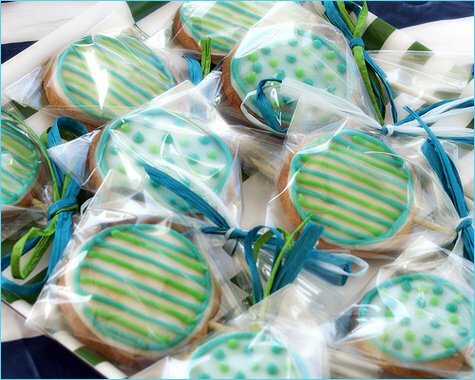 I used lots of blue and green pinwheels and buckets, as well as translucent blue and green baskets made of beach ball material to hold snacks. 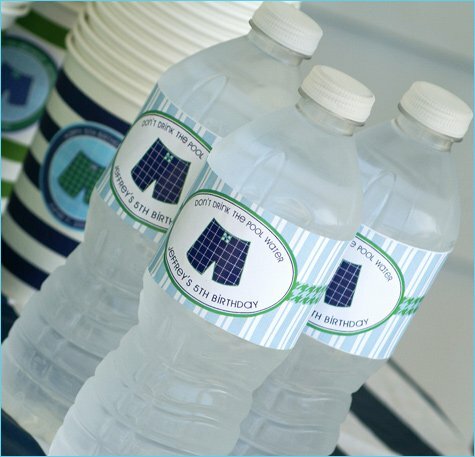 Fresh squeezed lemonade and ‘Don’t drink the pool water‘ water bottles were the drinks of choice! We served bagged lunches that had a homemade croissant sandwich, fruit cup with his party logo on top, and a bag of chips. 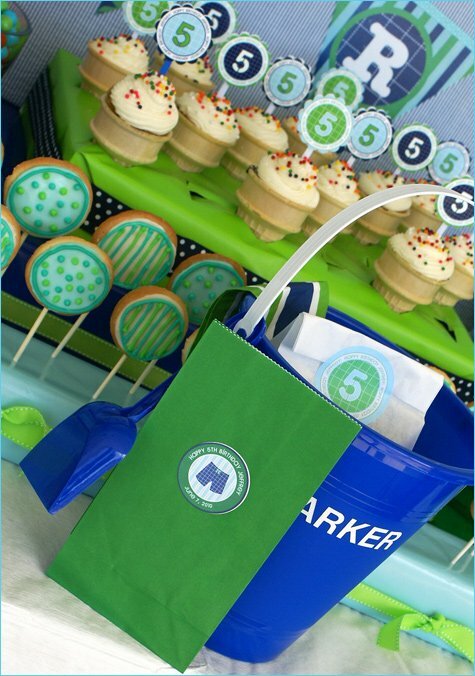 The lunch bags were placed in a blue (for boys) or green (for girls) sand pail that had a napkin hanging over the edge (Ikea). I personalized each ‘lunch pail’ with the child’s name. 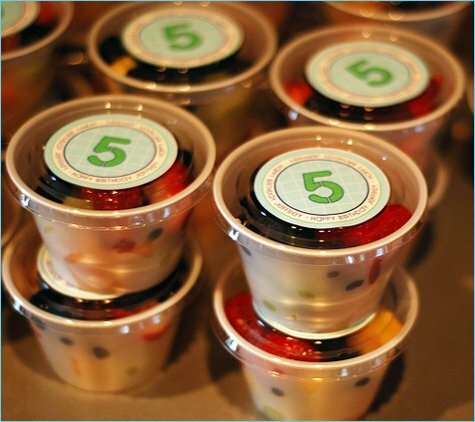 They could take their pail anywhere at the pool – the tables we had setup, under an umbrella on a beach chair, or wherever they decided to eat their lunch! 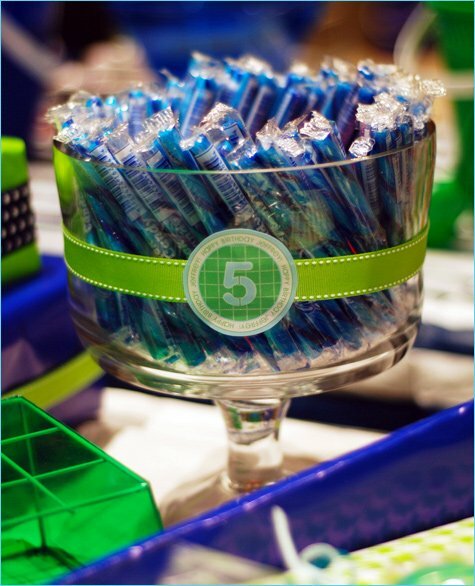 We featured a sweets table with various sweets and treats that were mainly blue and green. 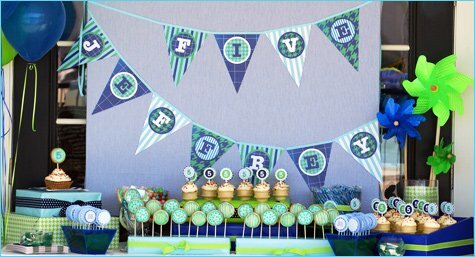 I decorated a fabric covered canvas for the backdrop (seersucker fabric) and made a pennant birthday banner that used greens and blues with modern, fun patterns. 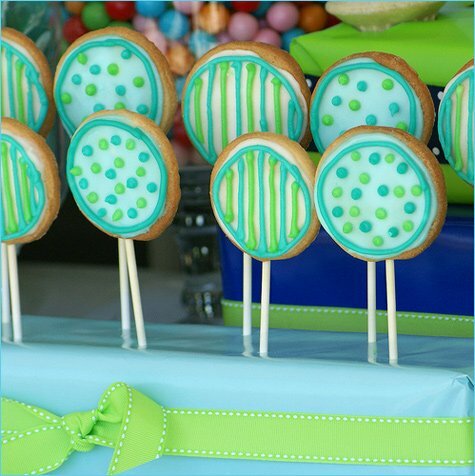 I made sugar cookie pops and cupcakes in ice cream cones and set out blue gummy sharks, colorful lemonheads that included green & blue tones, and old fashioned candy sticks with a blue swirl design. We also had organic lollipop (Earth Fare) covers that we designed to cover the lollis that stuck out of a blue/green wrapped box. Pinwheels adorned the table in large apothecary jars. 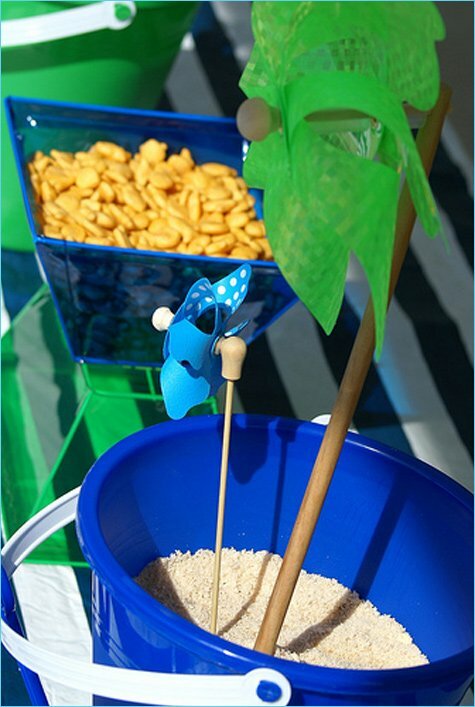 The tables also had these fun translucent blue containers filled with goldfish because all of our kids’ friends love those crackers. It looked like the fish were in fish bowls! 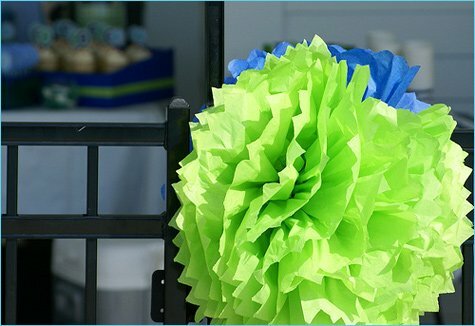 Tissue poms are a great DIY project. We used them to line the iron fence entrance to the terrace of the pool where our party was held. We also had bubbles that had custom labels on them for the prizes for the games we played. What a perfectly preppy party…I love it! Love it!! I see lots of stuff that is from the Target Dollar Spot too! 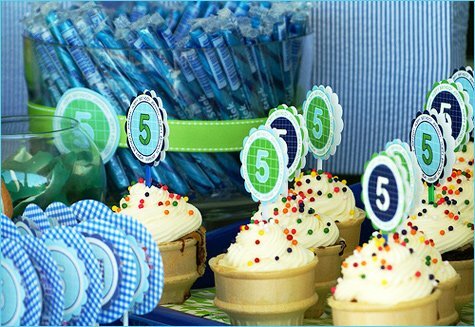 This party is so cute, I love the colors and all the details, they did such a great job! I love it!! 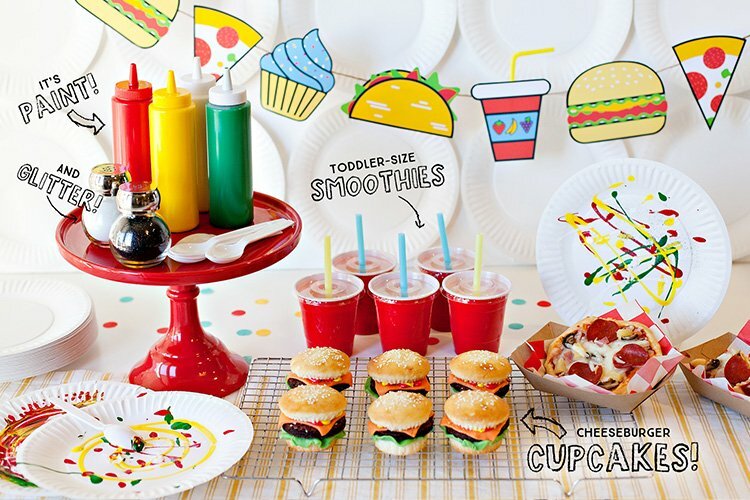 I would love to recreate this party bash for my little one, using Orange and Red! I love how they took this theme and made it their own. Love all of the extra details! Love all the details! I bet the kids loved their lunch pails. Adorable! This looks amazing! I love all of the details. 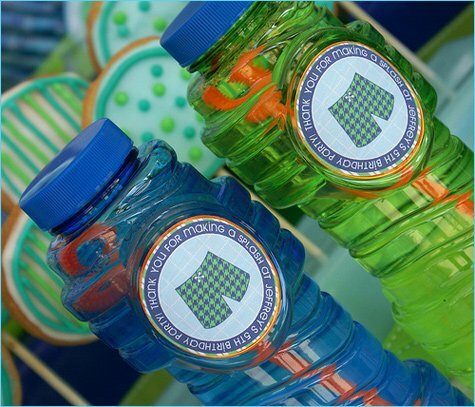 Those personalized pails are a great idea, I’m loving the water bottle labels! You gave out lots of great stuff at this party, and it looks like the kids are having a blast! I love all the details!! 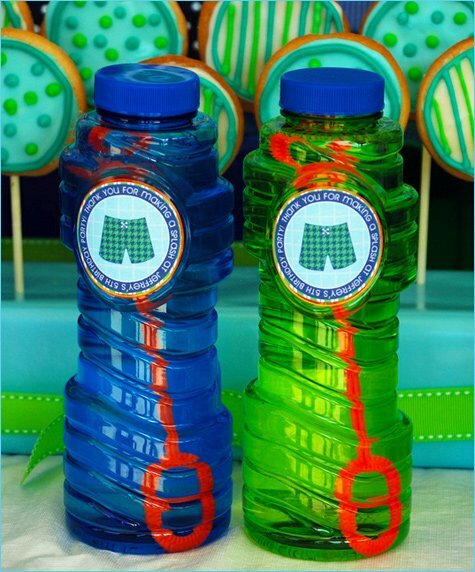 I have to keep the lunch-pail idea for my next parties!! This party looks fantastic! I love all the little details, the personalized sand buckets for every guest? Love it! This is adorable and inspirational! I love this blog!!! maureen and adria are so amazingly talented! they are so fun and easy to work with as well which makes everything so enjoyable! Hey Everyone – we’ve had questions about the party logos/labels/graphics from this party… just want you to know that we designed all of it! Check out our etsy shop for more designs! Thanks for the sweet comments!!! 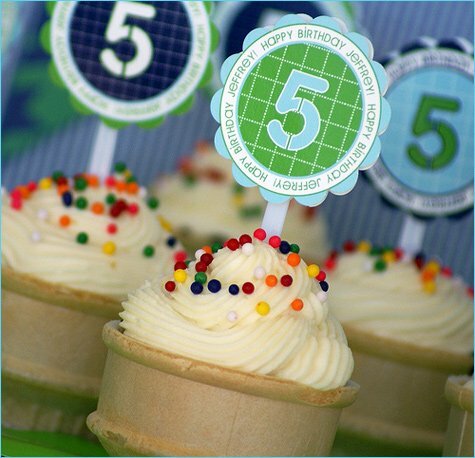 Hi, Where did you get your cupcake toppers? I really LOVE them. 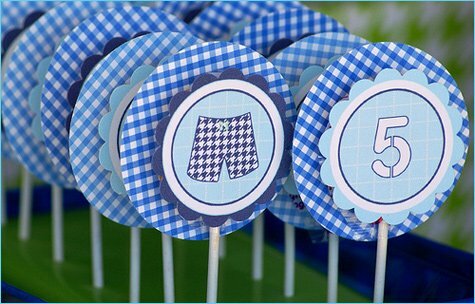 I actually Love these colors im planning on doing the same for my son who is turning 4 next month. I love the Splish Splash theme! 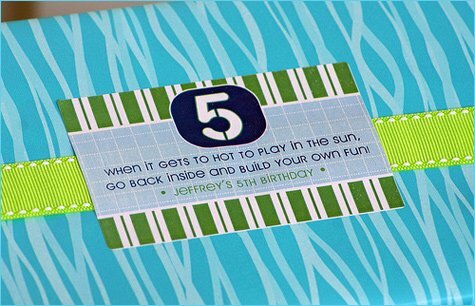 It’s perfect for summer birthdays! love the cupcakes and boxes you made for them. how did you make the boxes to hold the cupcakes? Ellen! This is Maureen Anders (from Anders Ruff Custom Designs, designer of the party) – I got boxes at LOWES that were meant for sprinkler heads (Rainbird brand, to be exact) – they had the perfect size holes in them. I just covered them with wrapping paper and used an exacto knife to cut x’s in them in order to put the cones in. L-O-V-E this! 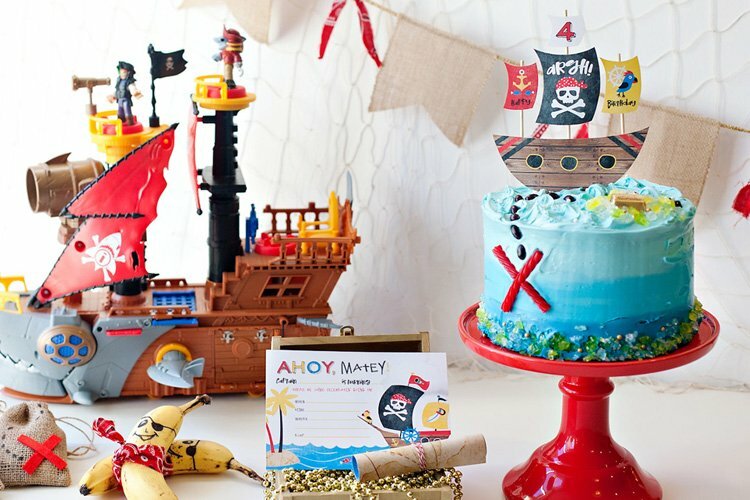 I will def be using some of these ideas for my son’s first birthday! Does anybody know the name of the font used in the labels? Thanks! This is SO cute! Where did you get the labels printed? How did you get the labels for the bubble jars and everything else so perfect? Did you use a program or a template? 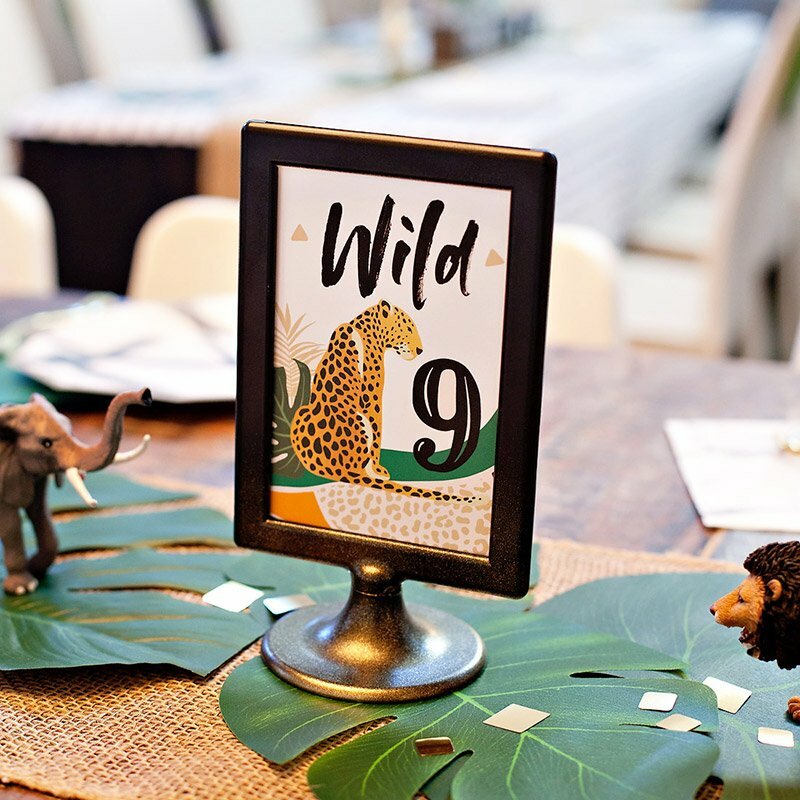 Is there ANYWAY to get printables for this party? Oh wow! The decorations and set up looks really amazing. I’d love to have a party with similar decorations for my son. 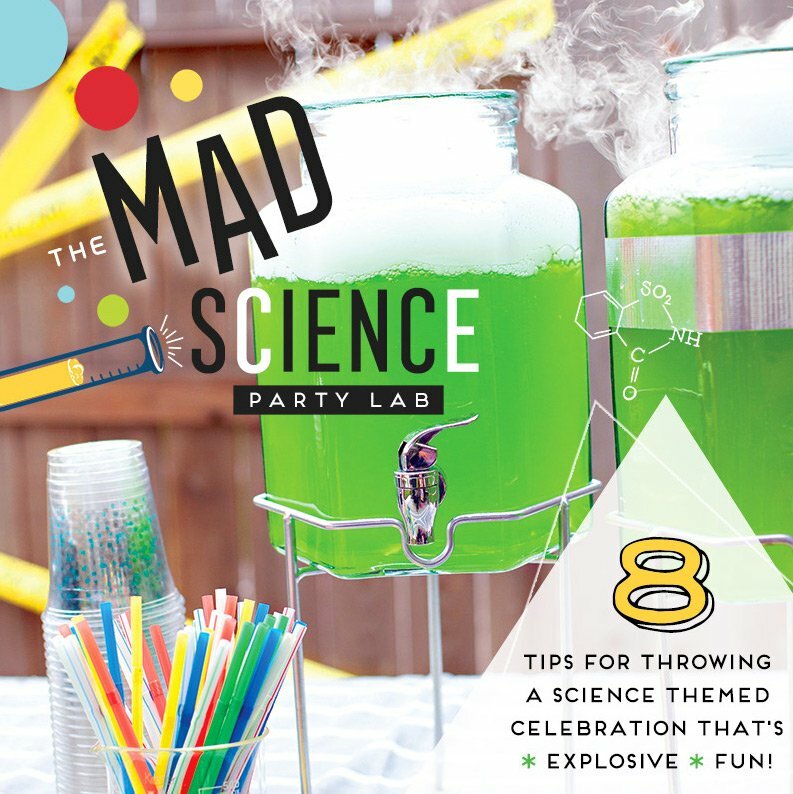 Ok this party is Perfect and EXACTly what I am looking for for my Son’s 4th birthday party next week! ahhhhh. Will you please let me know where/how to get all of the labels, banner, supplies etc?? Thank you soo much! 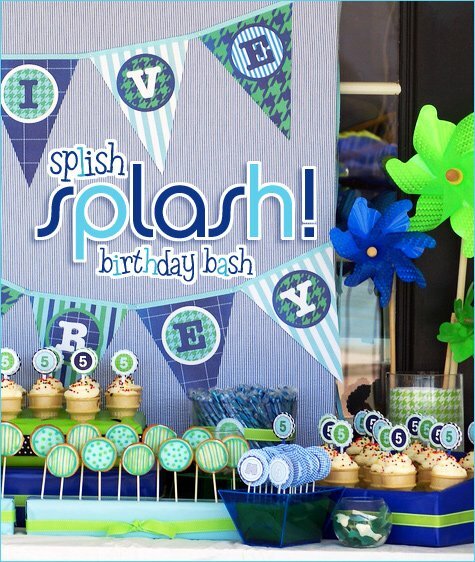 You can buy everything here: http://shop.andersruff.com/birthday/boy/splish-splash-pool-party-printables :) Good luck with the party! 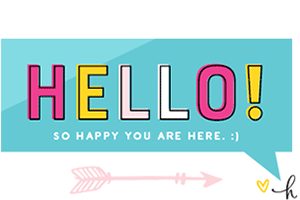 Hi Jenn- are these cute printables still for sale? I’m getting an error message when I clock on the link. Thanks! Just wondering if you sell the ‘splish splash! birthday bash’ sign? 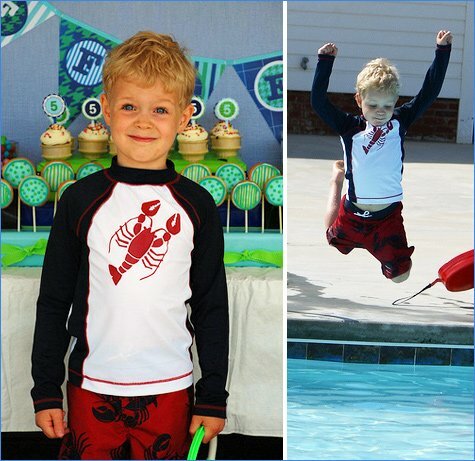 We are doing a water theme for my son’s 6th birthday and would love this!! Love the theme!! 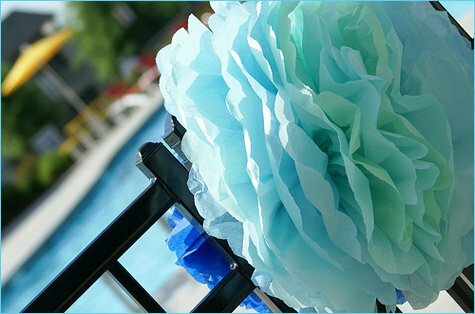 Having a swim party for my son in July! These are his favorite colors! 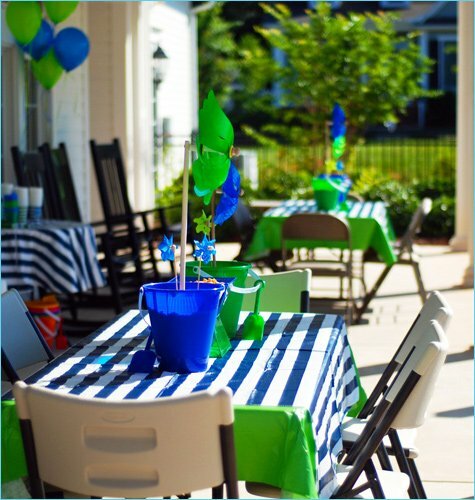 Where dd you get the blue/white striped table cloths? 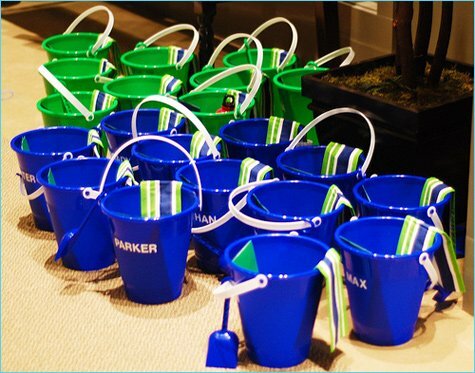 what did you use to personalize the pails? where did you get the letters? I was wondering the same thing about the pail letterng?